Go Greek with these juicy, pan-fried or barbecues spice-crusted lamb steaks, served with crushed chickpeas and a wild roquette salad. Rub the cumin seeds and oregano into the lamb on both sides. Heat 1 tablespoon of the oil in a frying pan. When hot, add the steaks and cook for 4-5 minutes on each side for juicy medium-rare meat, a couple of minutes more for medium. Remove the steaks, cover and keep warm. Add the chickpeas, seasoning and half the lemon juice to the pan. Crush half of the chickpeas with the back of a spoon to make a thickly textured sauce in the pan. Remove from the heat. For the salad, place the onion in a bowl and mix with the tomatoes, roquette, mint, remaining lemon juice and olive oil. 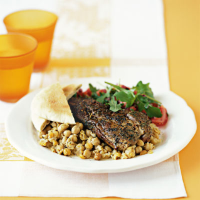 Serve the lamb steaks with the chickpeas, tomato and mint salad, and toasted pitta bread. Use other cuts of lamb if you prefer, such as fillet, chops, or leg steaks with the bone left in.